Become a Members! Get Special Stuff! 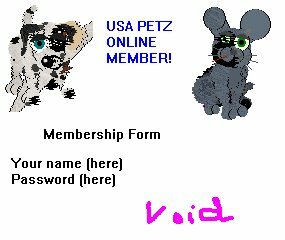 USA Petz Online has just decided to start a members page. If you join first of all, just for joinging, you get the Red Boomarang from the Add-On Pack. Next, you will recive a membership card like the one above, which you first must send an e-mail encluding your first name ONLY! Next I will send you your membership card, and a password, and you can get a free edited breed whenever one new one comes out without asking, and you get one Limited Edition Cat or Dog Edited Breed! Become a member today!! Send in your First name only to become a member!